Remember to sign up for next year! A $25 deposit by Oct. 30th will save your spot. if you can’t make it Monday or Wednesday we can pack up a share for you to pick up later, just let us know when you’re coming. We’ve never written a newsletter outside in the backyard before today, especially in late October. What an incredible fall! It has been a beautiful year, all along. A little too wet in the beginning, but then it evened out and gave plenty of sunshine, just enough warmth and a little rain to make for some pretty good harvests. It always feels good to enter the uncertainty of spring with your financial support, having prepaid for your share to help spread the risks of weather, insects and crop diseases, and it feels doubly good to finish fall knowing we’ve provided you with what we think is an excellent farm share. We hope you agree and can ride the carousel of ever-constant, ever-new seasons with us again! This much warmth in late October has kept a few things alive and growing that are usually gone or much less abundant by now. Usually this late we’re running much lower on greens, lettuce and spinach, but the warm sun has kept them growing. It also took away some of the sweetness in the spinach, but we had a good frost Sunday morning so it might be back. Broccoli and cauliflower are usually dead and limpy by now too, and while they haven’t been big heads or very productive, it has been nice to have some. And we can’t remember ever having celery this late. And several cold wet Octobers we’ve been soaked and cold what seems like every day, pushing trucks out of the mud and hunched over with the tunnel vision of a raincoat hood. So this almost feels like October hasn’t happened yet! This week the chill returns a little though, so we enjoy the present and hope the future doesn’t come, right?! Noooooo, just kidding, the cold and the dark hours are a good combo for many things, including catching up with oneself and loved ones. The next couple weeks we’ll spend mostly getting ready for the storage share — we’ll bring in the last of the carrots, beets and other roots, wash and sort potatoes, wash a couple bins of squash, see what we have left for sweet potatoes, and when it gets too cold for them we’ll pick the cabbage, leeks and brussels sprouts. We’ll change oils and do other maintenance, and put tractors and equipment away knowing it could snow us in for winter any time. Construction on the root storage begins sometime in November, so we’ll take down a few trees that don’t fit in the design, and start putting up some other firewood too. Hopefully we’ll have the frame up and roof and siding on by early December. Then we head in to the office, looking back over the year to see where we’ve gotten better and where we need to focus, going over the budget and buying supplies and equipment for next year, finding more great employees to help us grow your food, and do the puzzle of crop rotations, figuring out how much to grow and where each crop will grow best. That’s a long sentence, no wonder it takes a month or two, or more! It’s a good balance to keeping pace with the wild rush of plant growth in a northern summer. All our best to you for the winter! Thanks for your support, from all of us, we’re all happy as a worm in a hole to do this for you! This week looks pretty similar to last week. Another round of the yummy brussels sprouts (which keep for couple weeks in the fridge, on the stalk or in a bag) and parsnips, to compliment the other get-your-body-ready-for-winter foods. There’s enough spinach and lettuce to keep doing the amount we’ve had, and for greens we should have plenty of arugula and totsoi. The other ones are less cold-hardy so we don’t plant much of them in the last plantings (#20 and 21, or so), but we’ll cut what looks decent. Sweet potatoes we wish we had a little more, but at present it is one of those crops we harvest very inefficiently, so growing more doesn’t quite make sense. It looks like we’ve got enough to get us through to the end though. This week we’ll have more dirty ones available, in addition to some clean ones, since they’ll hold better for you that way. We’ll have daikon radishes (the long white ones), watermelon radishes (green and round, and yes they look like a watermelon when sliced), and purple top turnips. For carrots, we’re trying to have a mix of sizes out for everyone to choose from, but sometimes we end up with just smalls or just bigs out there — if you don’t see the size you want just let us know. We should have purple ones this week, and a few golden and chioggia beets too. Leeks did not do well, in an odd twist. We think it’s mostly due to a common virus called “aster yellows” — you may have seen it in any number of plants at home. It showed up in garlic a couple years ago (the first time it was ever recorded to be seen in garlic), and it also infected a row of echinacea in our back field. That echinacea was gorgeous in its first year– loaded with beautiful blooms which Erin used for tincture and which provided nectar for all sorts of bees and wasps and flies. We didn’t know the echinacea was infected when we planted the leeks this spring, but after a couple months the plants were gnarled and curly and yellow — soon after the leeks started getting yellow, and some were gnarly. Eventually a bunch just died and melted before sizing up, and much of the rest survived but was stunted. So this is not our best leek year ever; we may need to put a little limit on them but there should be enough to go around. Still no chard to pick, so kale it is. After Wednesday we will open a couple rows of kale for U-pick — the 4 rows east of the driveway, in front of where you park. For more details see the U-pick notes. Here’s to healthy eating, for you and for everybody! The more the merrier. 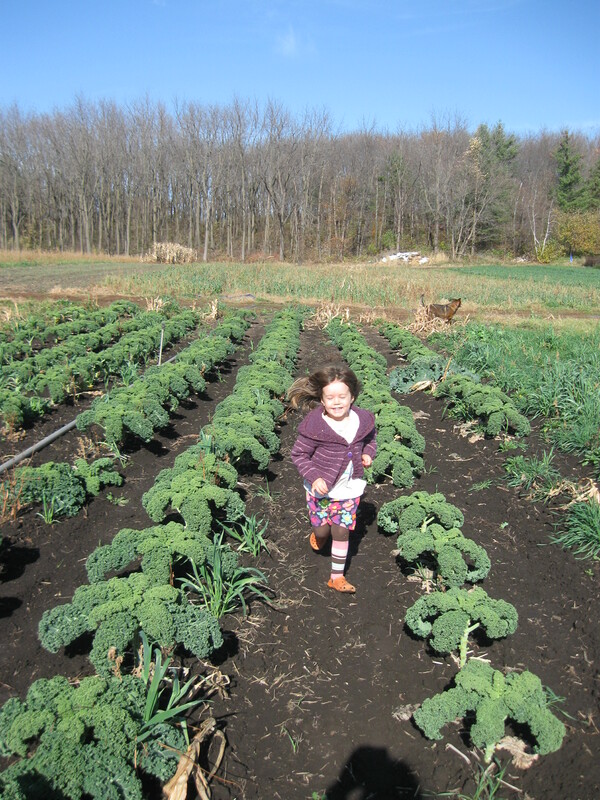 After Wednesday the kale by the driveway will be open for U-picking. Kale freezes very well, the curly is our favorite — blanch for 2-3 minutes, cool and drain, and place in freezer bag. Super for adding to soups, quiches, etc, or on its own with some soy sauce or other dressing, all winter long. Don’t pick the browning or yellowing leaves, there’s just a few that got sick. And the dino is more sensitive to cold — the leaves with a lot of grey markings aren’t good. But you can pick every last little tiny leaf, there even more tender and there’s no need to leave them on the plant. It will probably be open for picking until we have snow that sticks around. For herbs, it’s just the hardiest– oregano, thyme, sage and parsley. Plus some dregs of the cilantro. We will pick lots of these (not the cilantro though) for the storage share, so it will get used eventually. We so love seeing you enjoy the farm and picking your own. It is strange and sad to see you come and go faster now, without the picking to do. This is yet another sign of late fall! This is a good opportuniy to stock up for the next couple weeks if you like. This week’s selection is : Lettuce Mix and Arugula for $5 / lb, Spinach $4 / lb, Carrots and Beets for $1 / lb, Kale for $3.50 / lb, Cabbage for $0.70 / lb, Butternu, Squash for $0.70 / lb, Garlic $1 / head. Last share pickups are this week Monday Oct. 27th and Wednesday Oct. 29th, with no pickup on Friday. If you can’t make it let us know by Wed 6 pm and we can save a share aside for you. Remember to sign up for next year! A $25 deposit by Oct 30th will save your spot. After that we will begin contacting people on the waiting list. As always we encourage and need your feedback, thoughts, questions etc and look forward to another year with you! Especially if you won’t be signing up for next year, knowing why helps us make any related changes that we can to make the farm work better for more people. Do you know someone who might enjoy and/or benefit from a farm share? It looks like we’ll have a few shares available for 2015, since some folks are moving, lives are changing, and it’s likely that we’re adding a handful. Tell them to contact us asap, by email works well. Your recommendations mean the most to us, and have been and will be an important part of our success. Do you want a few veggies to get you through for the next couple weeks? Bulk orders are welcome this week, please do so by 8:30 am for Monday, by Tuesday morning for Wednesday. No need to pre-order for garlic. Thank you so much for eating with us in the risks and bounty of growing food in this wonderful soil, for this wonderful community! Soak the Brussels Sprouts in a large bowl of water for 10 minutes; drain. Spread the Brussels sprouts in a large baking dish and drizzle them with olive oil. In a large bowl combine the balsamic vinegar, garlic, and mustard; mix well. Pour the vinaigrette over the sprouts. Add the water to the bottom of the baking dish. Bake until the Brussels Sprouts are tender-firm, 30 to 45 minutes. Preaheat oven to 350. Line 2 cupcake tins with paper liners and set aside. In a medium bowl combine flour, cinnamon, ginger, cloves, nutmeg, baking powder, and baking soda. Whisk to combine. In the bowl of an electric mixer fitted with a paddle attachment, cream butter and sugar together until light and fluffy. Reduce speed to low and add eggs, one at a time, combining well after each addition. Add pumpkin and vanilla and mix to combine. With the mixer on low speed, add the dry ingredients alternately with the buttermilk, beginning and ending with the dry ingredients and mixing just until incorporated. Scrape down the sides of the bowl and mix for 15 seconds longer. Fill the cupcake liners 2/3 of the way full. Bake for 20-22 minutes, or until a toothpick inserted into the center comes out clean. For the frosting, cream the butter and cream cheese in a stand mixer until light and fluffy. Gradually add the sugar until incorporated. Then add the cinnamon, vanilla, and maple syrup. Mix for 10 seconds, until evenly combined. Frost cupcakes as desired.